We seem to have lost the extensive discussion on this power supply topic. I attached what I believe is the latest version. NOTE the parts list included in the attached zip file is REV 5 dated 12/13/13 and covers the next 125 pages of this tread. Does anyboady have the version for the OPA445 op-amp they have come back in stock at RS and ordered 10 of them so that I can continue with my version. Not sure if the above will work the same ? The OPA445 high voltage opamp will not work in the latest modification. 1) The MC34071 is not available anymore in a through holes package. 2) The value and size of R22 was changed. 3) The value of R17 was changed. 4) The 10V zener diode was added. Audioguru, do you have a copy of the last parts list using the alternate chips. I seem to remember some of revisions were in red. Here is the latest parts list that uses the new opamps. it is missing the 10v zener diode. Thanks, Now we have a sketch and some parts. We can continue the discussion. Okay - after 1 damaged Zener and 2 damaged power transistors my power supply is now finished. - I used the MC34072 oamps with max.44V instead of the MC34071. With the MC34072 I was not able to do the offset compensation. So the current limiting became a problem. ( When I turned the current limiting to minimum, it stopped limiting the current and damaged the power transistors with 24A output >:( ). So I used a 68Ohm resistor for R17 and all worked perfectly. - I used a 2x30V - 230VA Transformer with 32.47VAC without load. The problem is the voltage without load of about 45.91VDC - too much for the oamp. So I decided to use D15 in my shematics. In practice, the max voltage is about 44.1V so it will also work without D15. 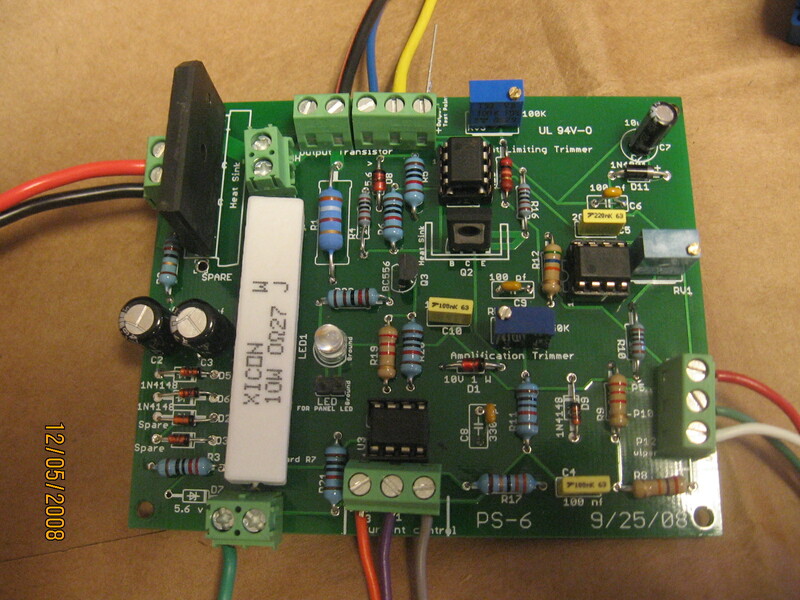 Here are pictures of my working Power Supply, my shematics with the (hopefully...) correctly bill of materials for my shematics. I decided to give you my bill of materials because there are a view mistakes and missing parts in the existing list. So I decided to throw D15 away and replaced it with a peace of wire. Now I am able to get 30V with 3A. If someone has the same problem as I (The rectifier voltage is to high for the oamps with 44V) you can use D15 which should have only as much voltage as you need to get under the 44V. The voltage in my circuit is about 39.6V - 44V and nothing is damaged. Your power supply looks good. I think the tiny 2N2219 Q2 driver transistor will melt if the output is shorted and the gain of the 2N3055 transistors is low. It will try to dissipate more than 3w which it cannot do even with a clip-on heatsink. A BD139 real power transistor should be used with a medium size heatsink. I do not understand why the current regulation failed when it was turned down. Since you reduced the unregulated positive supply by 5.6V with a zener diode can your project supply +30V at 3A without ripple? I have no oscilloscope to see if there is a ripple by 30V at 3A. I only have the small multimeter which shows 30V and 3A. But if I get the chance for an oscilloscope I'll post a picture. I would like to add to that circuit fine tuning for voltage and current. So i am asking where to put it on that circuit on first post? My minimum output is 40mV not 0V and i cannot correct it with RV1 it has no effect. Did i do something wrong or is it normal to get 40mV? You can add fine-tuning pots in series with the coarse adjustment pots but they will be always set to the wrong position. If you made the latest circuit with MC34071 or TLE2141 opamps then RV1 adjusts the 0V output to 0V if your voltage adjustment pot can give a 0V output. The output capacitor C7 makes the output positive without a load if it is an electrolytic type. A film capacitor will not. The opamps chosen are sold everywhere in the civilized world. Maybe not on your different planet. Digikey in North America and Farnell in many other countries sell the popular opamps. There are many newer opamps that can also work. You do not need to buy 100 MC34071A opamps at Digikey. They have many of them for a single quantity purchase. They have ordinary ones and "A" premium ones. Not another planet, just another continent, europe. From romania. To be honest i still have two places to ask for the opamps, but i asked for epuivalents to have a better chance at finding one of them and finnishing the psu, or even better ones, i mean some that have a higher max voltage for a better safety margin. Farnell have offices in many countries including Romania. They have hundreds of both opamps in stock in Romania. Go to www.farnell.com . I buy electronic parts from their office in Canada. ;D yes allready found it and the ic too i will place an order as soon as posible. thank you. Yesterday I got an oscilloscope to see if there is an output voltage ripple. And I have to say: I was not able to see a ripple. Not even by 0,05V/div. Thx for all your help! I can't remeber now and I know the Schematic say 28V AC but for the TLE2141 or MC34071 does the transformer have to be 28V AC or can it be a 30V AC ? Have a look at my post from August 27, 2009, 05:18:37. 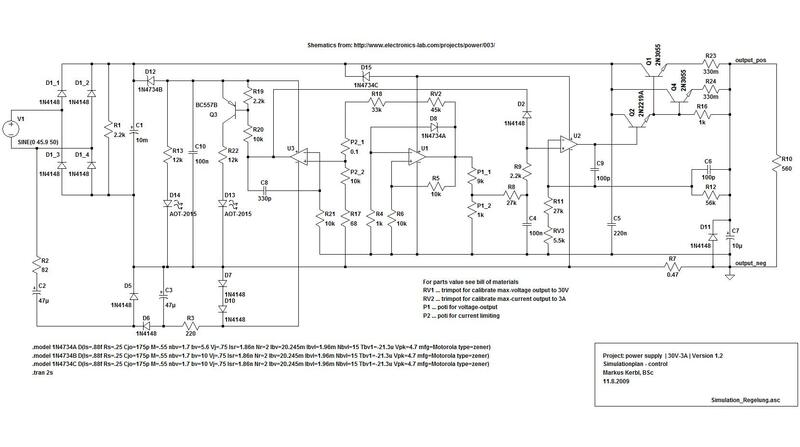 I posted my schematic with my bill of materials. 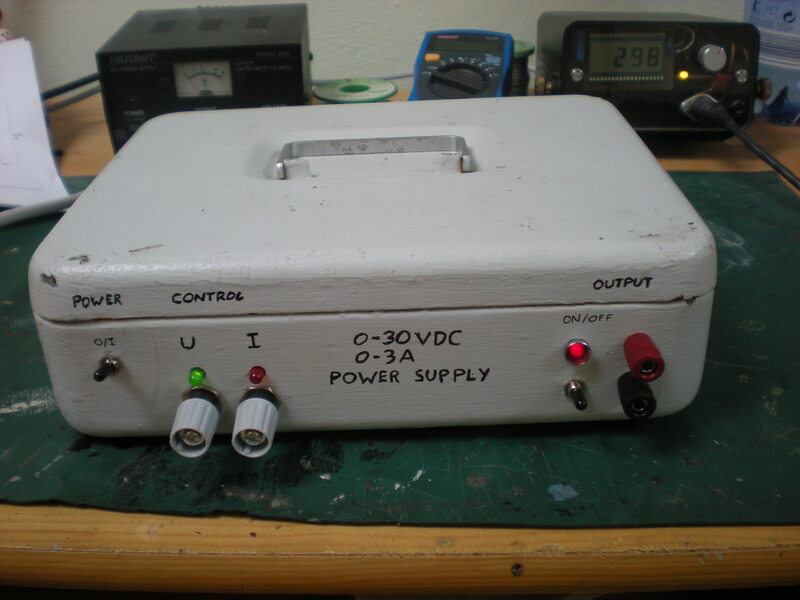 I built this power supply and it works perfectly! I used a 2x30V/230VA transformer in order to build a dual version. In my circuit, I did not need D15, although I used a 30V transformer! The OPA445 opamp is rated for a positive and negative 45V supply which is a total of 90V. It needs a different circuit to the latest one, U2 and U3 use a -5.6V supply and is similar to the original circuit. Its total supply was 48V. A 30VAC/4.3A transformer will be about 31VAC without a load. Its peak voltage is 43.8V and the rectifier bridge will drop it to 42.4V without a load which is fine for MC34071 or TLE2141 opamps that have a rating of 44V. A 28VAC transformer will be safer.